The $4.3 million judgments against the city and the councilmember were the last straw. 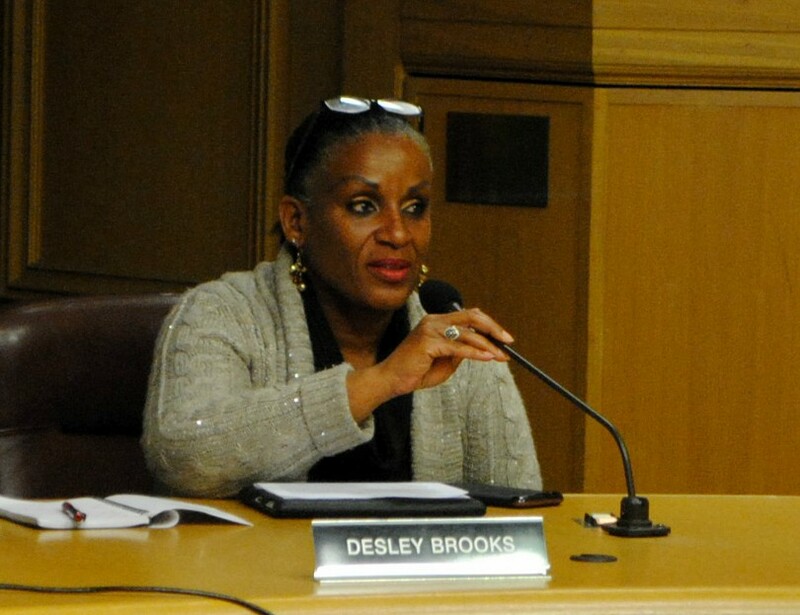 Desley Brooks has long been an embarrassment in Oakland City Hall. Over the years, the combative city councilmember has routinely been rude to, dismissive of, and abusive toward her council colleagues and the public. And now her anger — and violence — threatens to cost the cash-strapped city millions of dollars at a time when it can barely afford to pave streets, fix broken sewer pipes, and keep libraries open. In short, it's past time for the council to censure Brooks for gross violations of the council's official code of conduct. The last straw for Brooks was the recent $4.3 million legal judgments against her and the city of Oakland for her 2015 assault of ex-Black Panther Elaine Brown. An Alameda County jury ruled unanimously that the city must pay $3.75 million of that total because Brooks was acting in her official capacity as councilmember when she attacked Brown at Everett and Jones BBQ restaurant in the city's Jack London district. Witnesses said that just before the assault, Brooks had claimed that Brown's proposed affordable housing project in West Oakland was of "no benefit to Black people" because the plan didn't include for-purchase units. Witnesses said Brooks then threatened to use her position as councilmember to block Brown's plan before shoving Brown over a row of chairs, seriously injuring her. Brown, 74, had to be hospitalized with a torn rotator cuff. The jury ordered Brooks to personally pay Brown $550,000. Two other people also testified that Brooks had pushed or shoved them as well, including Carlos Plazola, a former aide to ex-Councilmember Ignacio De La Fuente. Two jurors told reporter David DeBolt of the East Bay Times that Brooks has "anger management" issues. One called her a "bully," while the other said she "abuses her power." Unfortunately for Oaklanders, the city's insurance policy will only pay $750,000 of the $3.75 million, so the city likely will have to slash programs and reduce services to pay the remaining $3 million — if the judgments are upheld on appeal. No elected official should ever act so irresponsibly as to lose $3 million in public funds. That's especially true in a city that doesn't have enough money to shelter thousands of people. And no elected official should ever violently attack another person. City councilmembers and mayors are supposed to lead by example — not be examples of how not to act. Alameda County District Attorney Nancy O'Malley also should've filed criminal assault charges against Brooks in the case. O'Malley's office blamed a lack of video evidence and conflicting witness statements for her decision not to prosecute Brooks. But the civil jury had no trouble reaching its verdict on the councilmember's actions. Yet even if Brooks escaped criminal accountability, she shouldn't escape accountability from the council. According to the council's official code of conduct, "abusive conduct" is grounds for censure. One could argue that Brooks has repeatedly violated that standard (see "The Case for Censure," 3/27/13). And there's no doubt that Brooks engaged in abusive conduct in the Brown case. Likewise, the council's code of conduct states that a failure to respect "the rule of law" is also grounds for censure. It's also worth noting that the council adopted its censure policy a few years after another case of misconduct involving Brooks — for what the county grand jury and then-City Auditor Courtney Ruby concluded in 2013 was the misuse of city resources to build a teen center in her district in apparent violation of the city's separation of powers law. The council declined to censure Brooks in that case in part because it hadn't yet adopted a censure policy. For years, some councilmembers have also shielded Brooks — particularly Larry Reid, Noel Gallo, and Rebecca Kaplan — by repeatedly declining to condemn her boorish behavior and aligning themselves with her. In October 2016, Brooks stood in front of the dais and yelled at her colleagues in an extended filibuster, refusing to give up the floor and demanding that they bring censure proceedings against fellow councilmember Lynette Gibson McElhaney. It's how Brooks operates: She publicly berates her colleagues and bullies them. Unfortunately, most of the council is too afraid of her to do anything about it. And many progressive city activists have consistently given Brooks a pass because she's tough on police. If Brooks had any sense of what's right after the Brown verdict, she'd resign. But she'll likely never do that. Another option is a recall campaign, but that seems unlikely, too — and probably not necessary, because she's up for reelection this year.